Since the announcement and subsequent release of the iPhone SDK, developers it seems have apparently fallen in love with the iPhone. Who buys Bejeweled and Zuma though? Who are these people who keep enabling PopCap to spam the gaming world with mediochre games? Anyway, a lot of awesome games are heading towards the iPhone so it’s not all bad. Namco and THQ are in on it and they make some good games so I’m excited to see where that goes.. Woosh on over to Kotaku to get the full story. “Take-Two Interactive announced today that BioShock 2 was officially in the works, under the development wing of the recently formed 2K Marin. The sequel to the Xbox 360 and PC shooter is planned for a fourth-quarter fiscal 2009 release date. Take-Two’s fiscal year matches the calendar year, so expect it to hit unspecified platforms before the ’09 holidays. So get your Eve syringes ready, we’re going down to Rapture once again. Maybe this time it’ll have some replay value (sorry guys, it’s true). Today video gaming is one of the largest forms of entertainment. My question is, why is not considered art? With controversial issues, political statements, and abstract forms of games, one might think that games could easily be labeled art. However, most film critics and people of the like say that games can’t be called art. Yet nobody denies that hip-hop is art when it quite obviously isn’t. There is no such thing as artistic when all it talks about is drugs and women. At least games cover a variety of subjects, although titles like Grand Theft Auto don’t help my case. Many people fail to look past the bad and see the beauty in the simple yet very complex experiences in games like the Guitar Hero series, or The Legend of Zelda. The list goes on. Video gaming is not all corruption, as people like Jack Thompson seem to think, calling games like Halo and Counter Strike “murder simulators”. He’s quite a character as he has consistently attempted to link video games and school shootings such as the Virginia Tech rampage and the more recent Illinois shooting only to be bluntly disproved on every count. People like him are the reason gamers feel unrest with the media. We can no longer trust the television news stations like Fox who seem to be on Jack’s side every single freaking time. But back to the point, video games can be an emotionally compelling experience, and that’s what I call art. Final Fantasy VIII was my first role-playing game and I have a true connection with that game. Many aspects of the game were very moving including the fantastic original score by acclaimed video game composer Nobuo Uematsu. I know every nook and cranny and I am very comfortable with it, though not in the typical serial killer developing way. Why isn’t that art? It was a beautiful and moving interactive story that has affected me emotionally more than many books or movies. Yet still the contemporary media has to focus on the games that mean nothing, the ones gamers eventually just leave behind. Games like Bioshock are also very artistic but get no credit from the media. It had a vivid environment, award-winning story, and a fantastic and award-winning (once again) soundtrack. I lol’d when I saw this. 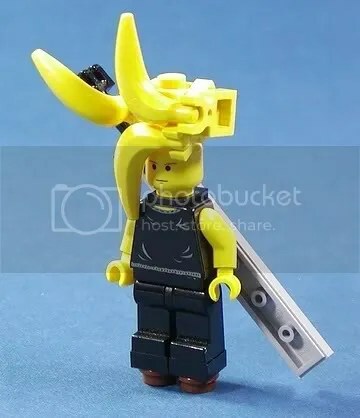 Someone liked a FFVII a little too much, and plays with LEGOs way more than they should. As if regular cupcakes weren’t awesome enough.